I don’t how many of you already hear about Influenster, but I really like this website! Today I will do a Review of VoxBox that I receive for FREE sent from Influenster, and this one have products that L’oreal. 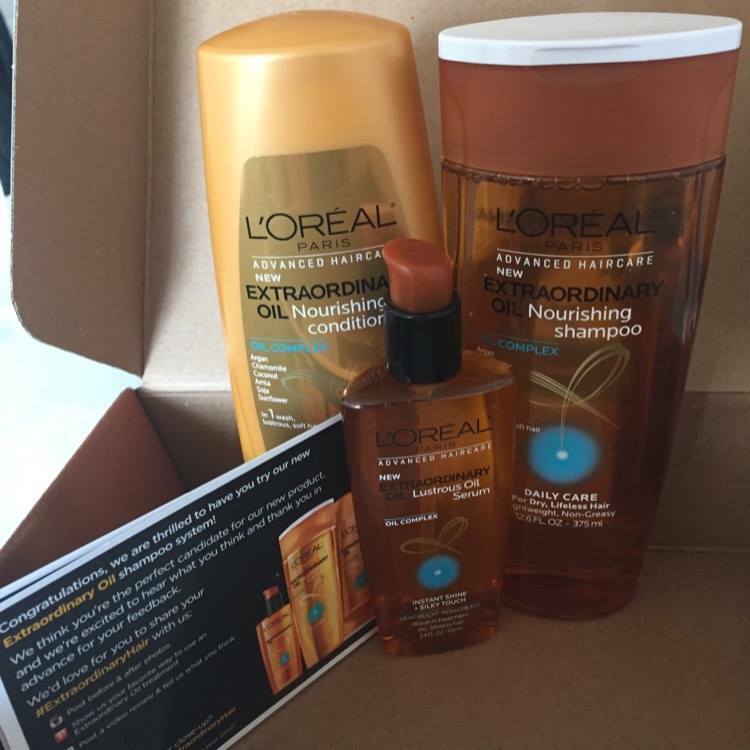 I received in this VoxBox 3 products full size all for FREE: shampoo, conditioner and the oil. All them are a new line of L’oreal products the Extraordinary Oil. The picture below is what I got in the Influenster VoxBox from L’oreal. With Oil-Complex – Coconut, Argan, Chamomile, Amla, Soja, and Sunflower. Deep nourishment without the weight for incredibly lustrous, touchably soft hair. After the first wash I already can feel a difference on my hair. I can feel that he is more soft and with seda touch, and I love this feeling. Also, have a lot mot shine without be oily. I dry my hair, I put the Extraordinary Oil on the ends of my hair looks better. It’s so amazing what this oil can do on my hair, without be heavy and look like oily. It’s a great product and last forever. The price is also good for this amazing product. L’oreal always surprise me with good products and good price. Way to go! Down here, I will put the link that you can buy the 3 products that I got on my VoxBox. Guys, I want to let the link to you sing up to the Influenster and start to receive products for FREE to make reviews. It’s a really good opportunity! Check it out and just click here to join the Influenster! Don’t forget to subscribe here to be the first one to know the new posts ;)And also don’t forget to follow us on the social medias, you can find us on: Facebook, Instagram, Twitter and Youtube.